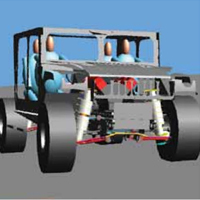 Pratt & Miller engineers used Adams and Adams/Car to design the front and rear suspension during the first few weeks of the project, long before there was a complete CAD model of the vehicle. One Adams analyst and two to three designers worked full-time on the front suspension while a similar team focused on the rear suspension. Adams simulations were used to evaluate and tune the suspension according to the specifications and also to supply loads to the designers for use in their FEA analyses. 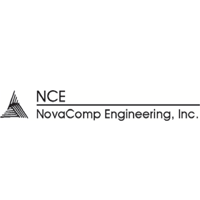 Founded in 1990, NovaComp Engineering, Inc., provides finite element analysis (FEA) as a service to a wide range of industries. By combining deep experience with state-of-the-art computing and analysis tools such as Marc, NovaComp helps engineers solve complex linear and nonlinear problems in the fields of heat transfer, stress analysis, structural dynamics, and fluid flow. With an extensive list of clients—including some of the most recognizable names in the high-tech industry—NovaComp’s small staff is accustomed to handling huge amounts of data that can be difficult to keep organized. The traditional method of organizing files was proving difficult for the staff at NovaComp to manage, as they often had difficulty identifying the latest version of each file. When the engineers at NovaComp receive CAD files from customers, they write a detailed description of each file as it comes in. Then they write another description after the file is revised, organizing everything within SimManager for quick access and retrieval.